Aviation Updates Philippines - Expect lower airfares after the Civil Aeronautics Board lifts the fuel surcharges of international and domestic flights by foreign and local carriers operating in the Philippines. The removal of fuel surcharges in an airline ticket is the agency's move after aviation fuel prices slides down. “With the substantial and continuous decrease of fuel prices in the world market, the Board has deemed it appropriate to compel airlines to discontinue their imposition of fuel surcharge,” the Civil Aeronautics Board said in its four-page resolution. According to Resolution No. 79 (BM 10-12-22-2014) dated December 22, the Civil Aeronautics Board lifts the authority to impose fuel surcharge both on domestic and international flights. The resolution states that oil prices dropped by 25 percent from June to November. No more fuel surcharge! 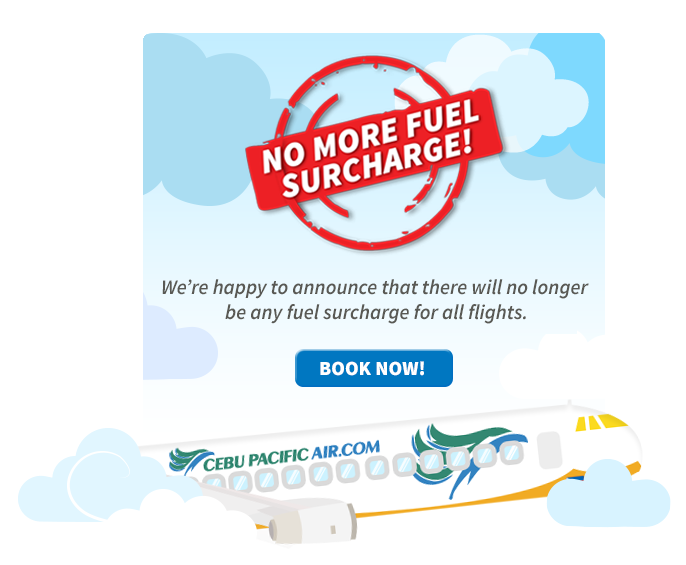 Cebu Pacific proudly announces the removal of fuel surcharge on its flights. Department of Transportation and Communications undersecretaries Jose Perpetuo Lotilla and Benito Bengzon Jr., Civil Aviation Authority of the Philippines director general William Hotchkiss III, and former Clark International Airport Corp. president Victor Jose Luciano signed the resolution. As fuel surcharge is being removed from tickets, passengers will enjoy a low cost of flying. However, there will still be other taxes present in the airline tickets such as the domestic passenger service charge, DPSC value added tax, aviation security fee, Manila aviation safety fee (for flights to Manila), value added tax, and the web admin fee (when booked online). Airlines are allowed to impose fuel surcharges to recover from higher costs of aviation fuel which makes the flight unprofitable. Aviation fuel remains as the carriers' largest flying expense. But this should no longer apply when oil prices are falling, CAB Executive Director, Carmelo Arcilla said. Copies of the resolution were given to AirAsia Inc. / Zest Airways Inc., Cebu Pacific Air, Inc., Air Philippines Corporation, Philippine Airlines, Tiger Airways Philippines, Air Micronesia, All Nippon Airways, Asiana Airlines, Cathay Pacific Airways, Etihad Airways, EVA Airways, Gulf Air, Hong Kong Dragon Airlines. Japan Airlines, Jeju Air, Malaysia Airlines, Qantas, Qatar Airways, and United Airlines.